This two hour UL rated fireproof file cabinet offers double the fire protection compared to most fire file cabinets on the market. FireKing has developed the Thermocell II insulation that makes this possible. 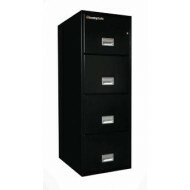 This four (4) drawer vertical file cabinet is designed to hold letter size documents only. For quickest delivery chose from our always in-stock colors: Black, Platinum, Parchment.. This is a tall fireproof file cabinet with a hidden security safe. What looks like the top drawer actually conceals a 2.4 cu ft capacity security safe. 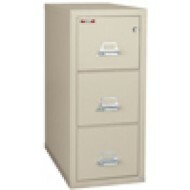 Like all Fire King file cabinets, this one has a UL fire rating. It also carries a UL impact rating. Chose from our instock colors - Black, Platinum or Parchment- for quickest delivery. The 3-2131-CSF fireproof file includes both UL 1 Hour fire and impact rating. The interior is graphite. Safe-in-a-File models may have key or e-lock options installed in regular drawers. 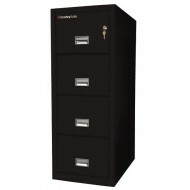 The top section of the file looks like a drawer, but really conceals a security safe. That false drawer opens only with a key lock. For fastest delivery, chose Black, Platinum and Parment colors. If (3) three drawers is the right size for you, you cannot do better than the sturdy build and 2 hour UL fire rating on the 3-1831-C. It has also been UL rated for impact resistance; drawers did not break open after a 30 foot fall in a fire. This fireproof file is designed to hold letter size hanging file folders. Chose from our always in stock colors: Black, Platinum and Parchment for quickest delivery. 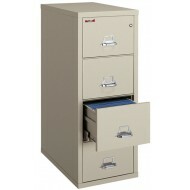 This large Fire King fireproof file cabinet has extra wide drawers prepared to hold legal size hanging folders. 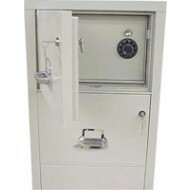 This is a UL rated fireproof fire cabinet and in addittion it has UL rated impact resistance. 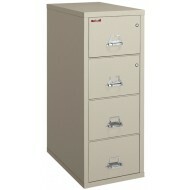 This four (4) drawer vertical file cabinet from Fire King is UL rated fireproof. The one hour fire rating and heavy duty build make this a great choice for sotring your important documents. The 4-1831-C is designed to hold letter sized documents.